I started working in prehistoric archaeology in 1977 at the National Museum of the Philippines and received formal academic training in Archaeology at the University of Pennsylvania specialized in Archaeometallurgy. I was the founding Director of the Archaeological Studies Program, University of the Philippines, Diliman in 1995. To date, as a Scientist III, I am coordinating, participating and conducting archaeological researches in Palaeolithic, Neolithic, the Metal Age, Protohistory, Underwater and Maritime archaeology. Doctor of Philosophy in Anthropology major Archaeology. Department of Anthropology, Graduate Faculty of Arts and Science, University of Pennsylvania, Philadelphia, PA, USA. Dissertation Title: An Iron Age in the Philippines? : A Critical Examination. Master of Science in Anthropology/Archaeology. Department of Anthropology, Graduate Faculty of Arts and Science, University of Pennsylvania, Philadelphia, PA, USA. Thesis Title: The Metal Age in the Philippines: An Archaeometallurgical Investigation. Bachelor of Arts in Philosophy, minor in Sociology. Faculty of Arts and Letters, University of Santo Tomas, Manila, Philippines. Thesis Topic: An Evaluation of the Elements of Filipino Philosophy. 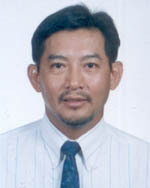 Dizon, Eusebio Z. The Archaeological Relationship Between the Batanes Islands (Philippines), Lanyu Island (Taiwan) and the Okinawan Islands (Japan). In Archaeological Studies on the Cultural Diversity in Southeast Asia and its Neighbors, edited by Masako Marui, editorial Committee of Fetschrift of the Retirement of Professor Yoji Aoyagi. Yuzamkaku Co. Ltd. Japan. Pp. 87-96. Dizon, Eusebio Z. Austronesians. In S�mah Anne-Marie and Kasman Setiagama; Francois S�mah, Florent Detroit, Dominique Griamaud-Herve and Christine Hertler (Editors) First Islanders, Human Origins Patrimony in Southeast Asia (HOPSsea). Impremeur Scriptolaser, Paris, pp. 102-104. Detroit, F. and E. Dizon. Homo sapiens. In S�mah Anne-Marie and Kasman Setiagama; Francois S�mah, Florent Detroit, Dominique Griamaud-Herve and Christine Hertler (Editors) First Islanders, Human Origins Patrimony in Southeast Asia (HOPSsea). Impremeur Scriptolaser, Paris, pp. 99-101. Gaillard, J-C; FG Delfin, Jr., E Dizon, VJ Paz, EG Ramos, CT. Remontigue, KS Rodolfo, FP Siringan, JL A Soria and JV Umbal. Planning for the Future: A Multidisciplinary Approach to Reconstructing the Buag Episode of Mt. Pinatubo, Philippines. In John Grattan and Torrence, Robin (Editors) Living Under The Shadow. The Cultural Impacts of Volcanic Eruptions. 53 One World Archaeology Series. Left coast Press Inc., Wallnut Creek, California, pp. 225-252. Hsiao-chun Hung, Yoshiyuki Iizuka,; Peter Bellwood Kim Dung Nguyen, Berenice Bellina, Praon Silapath, Eusebio Dizon, Rey Santiago, Ipoi Datan, and Jonathan H. Manton. Ancient jade maps 3,000 years of prehistoric exchange in Southeast Asia. Proceedings of the National Academy of Sciences, Wahsington DC. USA. PNAS 104(50):19745-19750. Dizon, Euseobio and Bobby C. Orillaneda. The San Diego and San Isidro Wrecks: Reflections on Philippine Ceramic Trade on Swatow Wares in the 16th Century. In Tan, Rita, Zhangzhou Ware Found iun the Philippines: �Swatow� Export Ceramics from Fujian 16th-17th Century. ArtPost Asia Pte Ltd. Malaysia, pp. 179-185. Szab�, Katherine and Eusebio Dizon. The Archaeology of Linaminan, Central Palawan. A Preliminary Report of Excavations. Hukay, Journal of the University of the Philippines Archaeological Studies Program, Volume 11, pp. 1-84. Dizon, Eusebio Z., Josefina G. Belmonte, Arnulfo F. Dado, Nida T. Cuevas, Leee Neri, Leo Batoon, Alexandra S. De Leon, Amalia A. De La Torre, Angel P. Bautista, Dangal De Los Angeles, Eduardo Bersamira and Reynaldo Bautista. Arroceros Forest Park Rescue Archaeology Project. Proceedings of the Society of Philippine Archaeologists, Volume 4:1-55. Bellwood, Peter and Eusebio Dizon. The Batanes Archaeological Project and the �Out of Taiwan� Hypothesis for Austronesian Dispersal. Journal of Austronesian Studies, Vol. 1, No. 1:1-33. Yoshiyuki, Iizuka, Peter Bellwood, Hsiao-chun Hung and Eusebio Dizon. A Non-destructive Mineralogical Study of Nepritic Artifacts from Itbayat Island, Batanes, Northern Philippines. Journal of Austronesian Studies, Vol. 1, No. 1: 83-107. Dizon, Eusebio. The Role of the Philippines as an Entrepot during the 12th � 15th Century�s Chinese and Southeast Asian Trade Network. In Cheng, Pei-kai, Li, Guo and Chui Ki Wan, (editors) Proceedings of the International Conference: Chinese Export Ceramics and Maritime Trade, 12th � 15th Centuries. Chinese Civilisation Centre, City University of Hongkong. Pp. 280-301. Dizon, Eusebio, Clyde Sheldon Jago-on, Nida T. Cuevas, Alexandra S. De Leon. Archaeological Report on the Old Taal Church Ruins, San Nicolas, Batangas. In Proceedings of the Society of Philippine Archaeologists Volume 3: 13-27. Katipunan Arkeologist ng Pilipinas, Inc.. Manila, Philippines. Dizon, Eusebio, Alexandra De Leon, Alexandra, Ligaya Lacsina and Giovanni Bautista; Ligaya Lacsina and Giovanni Bautista. A Brief Report of the 2005 Archaeological Exploration and Excavation of Itbayat Island � Batanes, Philippines. Test Pit No. 7:8-10. UP Archaeological Studies Program. University of the Philippines, Diliman. Quezon City. Dizon, Eusebio, Amalia De La Torre, Nida T. Cuevas and Ligaya Lacsina. The Archaeological Excavation of the Karingal Property Site at San Nicolas, Batangas: A Preliminary Report. Test Pit No. 7:14. UP Archaeological Studies Program. University of the Philippines, Diliman. Quezon City. With Gaillard, Jean-Christophe, Francisco Delfin, Jr., Eusebio Dizon, John A. Larkin, Victor J. Paz, Emmanuel G. Ramos, Cristina T. Remontigue, Kelvin S. Rodolfo, Fernando P. Siringan, Janneli Lea A. Soria and Jesse V. Umbal. Dimension anthropique de l�eruption du Mont Pinatubo, Philippines, entre 800 et 500 ans BP. L�anthropologie 109:249-266. Dizon, Eusebio Z. The Role of Archaeology in Restoration. Hukay 6:28-33. Dizon, Eusebio Z. The 2004 Archaeological Exploration and Excavation in the Batanes Islands. Test Pit No. 4. UP Archaeological Studies Program. University of the Philippines, Diliman. Quezon City. Dizon, Eusebio Z. Solheim�s Influence to Underwater and Maritime Archaeology in the Philippines. In Southeast Asian Archaeology Wilhlem G. Solheim II Fetstschrift, edited by Victor Paz. The University of the Philippine Press. Diliman, Quezon City, pp. 292-314. Detroit, Florent, Eusebio Dizon, Christophe Falgueres, Sebastien Hameau, Wilfredo Ronquillo and Francois S�mah. Upper Pleistocene Homo sapiens from the Tabon cave (Palawan, The Philippines): description and dating of new discoveries. Comtes Rendus, Palevol.3 (2004): 705-712. Academie des sciences. Elsevier Academic Press. Paris. Peter Bellwood, Janelle Stevenson, Eusebio Dizon and Atholl Anderson. Archaeological and Palaeoenvironmental Research in Batanes and Ilocos Norte Provinces, Northern Philippines. Indo-Pacific Prehistory Association Bulletin, 23(1):141-161. Dizon, Eusebio. New Direct Dating of the Human Fossils from Tabon Cave, Palawan, Philippines. In Proceedings of the Society of Philippine Archaeologists. Semantics and Systematics: Philippine Archaeology. Katipunan Arkeologists ng Pilipinas, Inc.. Manila, Philippines, pp.63-67. Dizon, Eusebio. Anthropometric Pottery from Ayub Cave, Pinol, Maitum, Sarangani Province, Mindanao. In Earthenware in Southeast Asia. Proceedings of the Singaporean symposium on Premodern Southeast Asian Earthenwares, Edited by John N. Miksic. Singapore University Press. National University of Singapore. Pp.52-68. Dizon, Eusebio. Underwater and Maritime Archaeology in the Philippines. Philippine Quarterly of Culture & Society, 31:1-25. Dizon, Eusebio. A Second Glance at the Calatagan Pot. In Cynthia Valdes (ed.) Pang-Alay, Ritual Pottery in Ancient Philippines. Ayala Museum. Makati City. Pp. 39-42. Dizon, Eusebio and Gay Lacsina. A Site Visit to an Old Kiln site in Rizal, Cagayan Valley. Test Pit, 2(1):6. Dizon, Eusebio Z. Batanes Archaeological Project: 1996-1997 Status Report. Ivatan Studies Journal, V-X:9-18. Dizon, Eusebio and Jun Cayron. Archaeological Excavation of a Stone Boat-Shaped Burial No. 7 at Locality I, Nakamaya, San Antonio, Basco, Batanes. Ivatan Studies Journal, V-X:19-28.
b Florent Detroit, Francois S�mah, Christophe Falgueres, Sebastien Hameau, Notes on the Morphology and Age of the Tabon Cave Fossil Homo sapiens. Current Anthropology, 43(4):660-666. Dizon, Eusebio and Bobby Orillaneda. Ming Blue and Whites Found from Shipwrecks in the Philippines. In Peter Lam (ed.) Yuan and Ming Blue and White Ware from Jianxi. Jointly presented by Jianxi Provincial Museum and the Art Museum, The Chinese University of Hong Kong. Pp. 211-223. Dizon, Eusebio and Alfred F. Pawlik. The Lithic Studies Laboratory: A new research facility of the Archaeological Studies Program, University of the Philippines, Diliman. Hukay, 4(1):iii-viii. Ronquillo, W. and E. Dizon. Recent field campaigns on the Tabon site, Philippines (Abstract) in Chronology of southeast Asian Palaeolithic since the late Homo erectus period. Preactes du XIVe Congres de l�UISPP, Liege, Belgium.